On these beautiful spring days, it's tough deciding how to spend the mornings: head outside and weed among the daffodils or throw on an apron and get floury in the kitchen? Here's a quick bread recipe that lets you do both--Pita! With a relatively rapid rising time (30 minutes) you can have the satisfaction of having your hands in both dough and dirt in the same morning. Just be sure to use that nail brush in between! 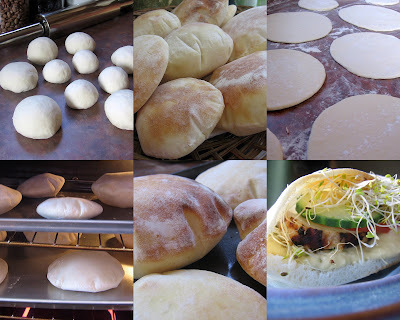 Pita bread is something my family has been making for as long as I can remember. They are so fun to make and puff up nicely, leaving a hollow center to fill with grilled chicken, veggies or whatever you desire. They are pretty amazing just warm from the oven with a drizzle of olive oil. Here's my favorite hummus recipe, in case you need an accompaniment for your pitas! Reminiscing over Italy and the sandwich that came of it. If you were to rewind ten years back you would find me eagerly stepping off a boat on a rainy April morning onto Italian soil. Six weeks of backpacking in South East Asia had left me ravenous for some good, crusty bread and I knew I wouldn't have to look far. An apparent dependency on all things yeasty had surfaced amidst the many bowls of perfect Pad Thai and sublime Nasi Goreng, and despite my love of those flavours, I couldn't help but dream about the focaccia and calzone of 'the Boot'. I had arrived in Brindisi via a flight to Turkey and a boat from Greece and to me, this port town had it all going on. No, there was no Ponte Vecchio or Trevi Fountain, but I quickly found all I needed- a bakery. It had just opened it doors for the day and the shelves were stacked high with the most knee-weakening array of Italian specialties I could have ever hoped to see. This small-town Canadian girl nearly swooned at the perfectly dimpled Focaccette al Rosmarino, fruit and nut studded Cantucci and Biscotti, rustic peasant Pagnotta and perfect Grissini. I don't remember all that I purchased, but it was way more than I could possibly eat for breakfast. Standing at a small bar, I washed everything down with a perfect café and the gruff yet efficient clerk wrapped up the leftovers in brown paper and string for me, rations for the long train ride to Roma. The rain soaked me as I walked the nearly deserted streets, but I barely noticed. My belly was happy and so was I.
I was to stumble upon a market a little later in the day and again satiate my bread-lust with a roasted vegetable-laden focaccia and a sausage-stuffed panini--both of which today's immense sandwich reminded me of. I guess that is why we took this little trip back in time; flavors have a strong tendency to transport one back to a certain spot, no matter how many years have passed. How amazing that memory fails, but taste buds do not! I finished my gastronomical feasting for the day with a lemon gelato and another coffee before heading to the station to catch my train. Brindisi had been good to me and the rest of Italy awaited. Combine red pepper, zucchini, lemon and red onion in a bowl with a generous splash of olive oil and toss to coat. Season with salt and grill everything until soft and cooked. The lemons will only take a few seconds on either side. Reduce the heat of the grill to low. Slice buns in half, brush generously with olive oil and grill slightly. Pile all ingredients onto the bottom two buns and place the top bun on the pile. Yep, it will look gigantic! Grill in a panini press until cheese is melted OR, if you are like me and don't have a panini press, simply wrap a brick with tinfoil and place it on top of the two sandwiches on the BBQ. You will need to flip the panini once if you are doing this. Enjoy possibly the best sandwich you have ever had. 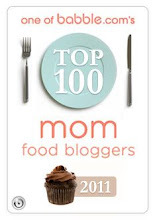 By now you know that if I discover something great, I'm going to share it with you, and so here is a find for all the new or soon to be mama's out there! My latest and greatest haunt is Nurture-Baby, an adorable site all about making your own baby food. I know, you probably think I've got that area pretty much covered, I mean, how hard is it to make a puree, right? But since my kids are so frustratingly picky, I'm more than open to new mealtime suggestions and Nurture Baby has provided some fresh fodder for under the high chair! Broken down into categories such as 'recipes', 'nutrition' and 'techniques', this site is a thorough resource for homemade baby food. I love how the recipes are categorized by the babies's age and guess what? the photos actually make the dishes look appetizing! Not easy to do when the subject is, hmm, brown mush! 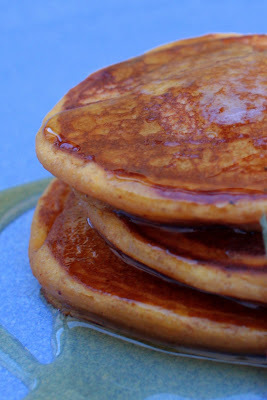 Noah and Mateo gobbled up-and I mean inhaled-these Sweet Potato Pancakes. We're pancake fiends around here, so I knew I had to try this recipe. Thank goodness it makes a generous batch because they were sooo good! 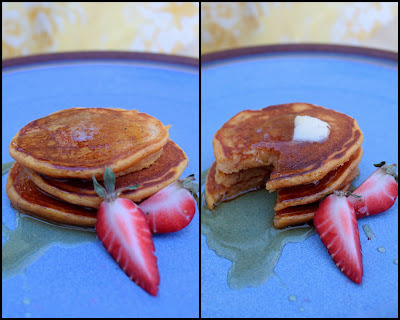 Think: pumpkin pie pancakes (psst! I think they should be renamed) thanks to the spices, sweet potato puree, brown sugar, and melted butter. 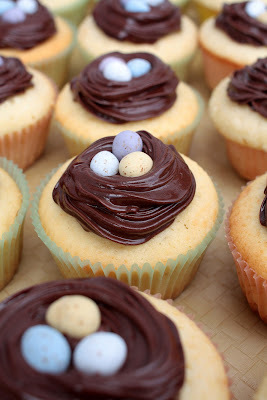 Maple syrup complemented them wonderfully, but they really need no dressing up and were perfect finger food for Mateo. 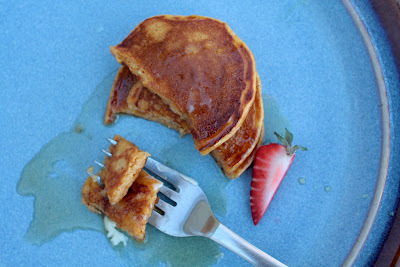 Danny and I scarfed these pancakes for breakfast the next day, so this recipe is by no means just for little ones! I recommend thinning out the batter with an extra 1/4 cup of milk or so and cooking them on a medium-low heat to ensure they are cooked through. Eager for another success, Noah and I baked up a batch of Banana Oatmeal Cookies and were rewarded with delicious soft cookies that we couldn't stop eating. 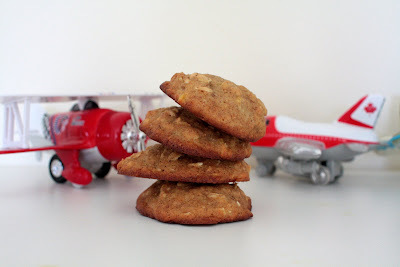 Reminiscent of banana bread, these healthy cookies make a huge batch and are sure to please the somewhat critical playgroup gang. I'll be recommending Nurture-Baby to all my friends with new little ones--maybe they will stop pestering me for those baby food tutorials!! Believe me when I say I really wanted to come back with a healthy, non-dessert recipe, but the truth is I've been living off of these cupcakes for days. You know what else is the truth? After a few days away from keyboard, I start to miss blogging--and I especially start to miss all of you. That's why I'm back already; I couldn't stay away. I got through the busy weekend pretty well, thanks to a lot, and I mean a lot, of Cadbury mini eggs. Well, it wasn't all smooth sailing, there was that minor mishap on Easter Sunday morning when we were getting ready for church. In my ever-present battle against Noah's dry skin, I grabbed what I though was his moisturizer and liberally-yes, even hastily-applied it all over his arms, torso and face...only to discover seconds later that it was my moisturizer with a hint of sunless tanner. What ensued afterward was an encounter with a washcloth so thorough, it left us both more than a little hot under the collar. That stuff streaks like nobody's business. 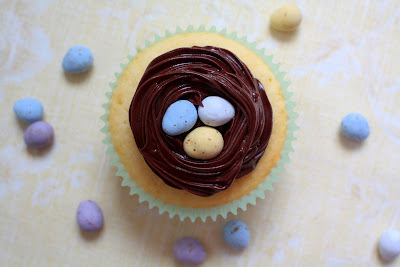 OK, so it's a little late to be bringing you Easter treats, but you must look past the mini eggs and focus on The Perfect Cupcake: Yellow Butter Cake with Dark Chocolate Frosting. This one is Martha Stewart all the way and there is simply no need to mess with it. She's serious when she says it's a crowd-pleaser; it's a combination so classic and homey that no one can resist. I've certainly demonstrated that I can't. So there's some pretty cool stuff coming up on Under the High Chair that you'll just have to see to believe. 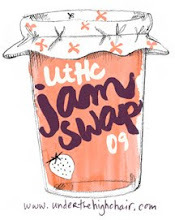 Yep, more super cool giveaways, a pancake the tastes like pumpkin pie, and...An Announcement. Ohhh. I'll give you a hint: what do you get when you combine a Pregnancy, a Pen and a Publisher? Find out soon and don't bother to try and drag it out of me, my own mother doesn't even know! Preheat oven to 350 degrees. Butter two 9-by-2-inch round cake pans; line the bottoms with parchment paper. Butter parchment, and dust with flour, tapping out excess; set aside. FOR CUPCAKES: Line two standard 12-cup muffin pans with paper liners. Into a medium bowl, sift together flours, baking powder, and salt; set aside. In the bowl of an electric mixer fitted with the paddle attachment, beat the butter and sugar until light and fluffy, 3 to 4 minutes, scraping down the sides of the bowl as needed. Beat in eggs, one at a time, then beat in vanilla. With the mixer on low speed, add the flour mixture in three parts, alternating with the milk and beginning and ending with the flour; beat until combined after each addition. Divide batter between the prepared pans, and smooth with an offset spatula. 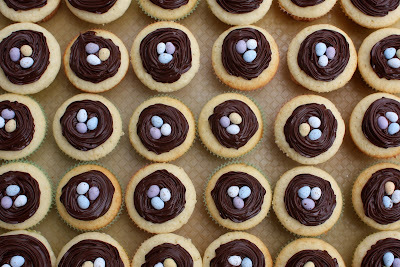 For Cupcakes: divide the batter evenly among the prepared cups so that each is about two thirds full. Bake, rotating the pans halfway through, until cakes are golden brown and a cake tester inserted into the center comes out clean, 30 to 35 minutes. (20 min. 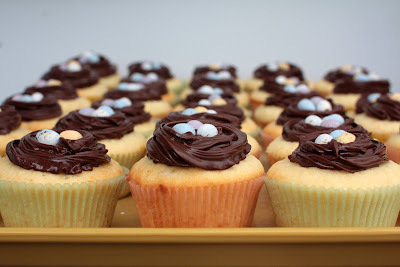 for cupcakes) Transfer pans to a wire rack to cool 20 minutes. Invert cakes onto the rack; peel off the parchment. Reinvert cakes and let them cool completely, top sides up. Frosts one 9-inch layer cake or 24 cupcakes, generously. 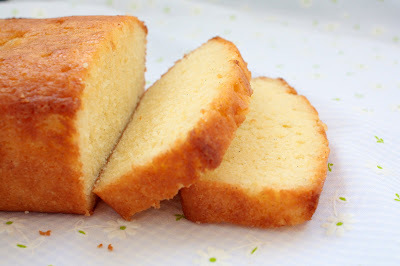 In the bowl of an electric mixer fitted with the paddle attachment, beat butter, confectioners' sugar, and salt on medium-high speed until light and fluffy, 3 to 4 minutes. Add melted chocolate; beat on low speed until combined, 1 to 2 minutes, scraping down the sides of the bowl as needed. Beat in cocoa mixture. 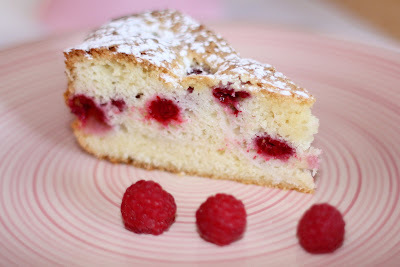 To frost a layer cake: Using a serrated knife, trim tops of cakes to make level; brush off crumbs. Place four strips of parchment paper around perimeter of a serving plate or lazy Susan. Place the first layer on the cake plate, and spread top with 3/4 cup of frosting. Place the second layer on top, bottom side up, and spread top with 3/4 cup of frosting; repeat process with the third layer. Place the remaining layer on top of the third layer, bottom-side up; insert a dowel into the center of cakes if necessary. Spread entire cake with remaining frosting. If you take the usual packed schedule of Easter, add a birthday brunch and a wedding shower, you have my agenda this weekend. Toss in a sick computer to the mix, and it makes for a few days of difficult blogging. On top of things, my family and I are both celebrating the birth of a new baby and mourning the death of an uncle this week, and so I'm sure you'll understand why I'm taking a brief hiatus from UtHC and all my favorite online haunts. Gathering with friends or family for bunch any day is always special, but there is something about a brunch on Easter weekend that I especially love. It might even be my favorite holiday event. Why? Maybe it's because it is one holiday where there is no last minute scramble for gifts, no turkey to take up all the space in the fridge, and no tacky red and white decorations. (respectively, Christmas, Thanksgiving and Valentine's). I'm also a sucker for spring flowers-bulbs of any kind-and the abundance of chocolate everywhere sure doesn't hurt. This year we're invited out for brunch, so I'm not cooking, but I am contributing some Lemon Poppyseed Madeleines and Current Scones. 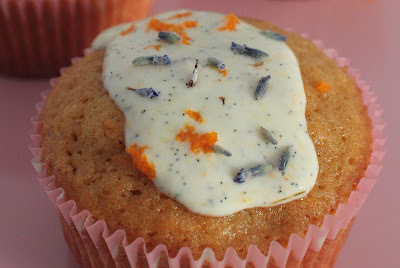 Neither recipe, I am just now noting, are available to you on this blog. I am such a slacker! Please accept these suggestions in their stead. Most of these breakfast/brunch favorites can be easily transported and would make a lovely hostess gift if you are not entertaining at home, but rather brunching out. 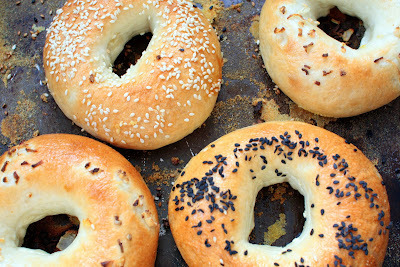 Let's start with bagels, shall we, because the kind of brunch I want to go to is one that has a bagel and lox bar. You know the kind I'm talking about: a mountain of smoked salmon or lox, lemon wedges, chopped fresh dill, cream cheese, capers, sliced red onion and beautiful, plentiful bagels. Fortunately these freeze well, so you can get the real work out of the way a week or so in advance. Serve lightly toasted. For the planner... this recipe is great because it can all be assembled the night before. In the morning just pop it in the oven, make coffee and whip the cream! 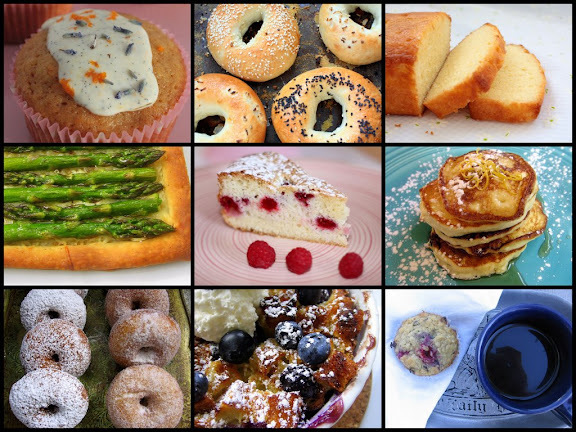 If the perfect muffin is your ideal way to start the day, then here are two easy recipes. The hardest part? Deciding which kind to make. Happy brunching everyone and remember, everything must be served with a side of bacon!